(7:00pm, Northbrook Public Library, Pollack Room) Meredith Tucker of Citizens for Conservation (Barrington) will give a speech about “saving living space for living things, one yard at a time.” This program is sponsored by the Northbrook Public Library and Go Green Northbrook. GGN this program about Somme Woods and Prairie by Stephen Packard, Linda Masters (absent due to illness), Jeanne Dunning and Sai Ramakrishna. We learned how to participate in seed gatherings, controlled burns, prairie and oak woods restoration plus other ways to enjoy this little-known resource. 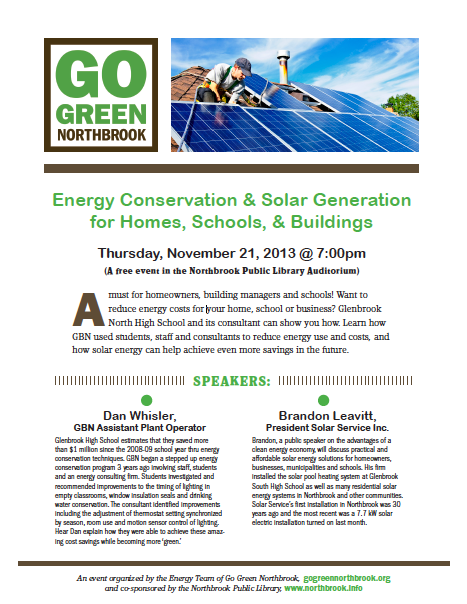 GGN presented this program with Dan Whisler, GBN Assistant Plant Operator, and Brandon Leavitt, President of Solar Service Inc. and GBN solar consultant, who discussed GBN’s energy conservation program and benefits.